We’re just going to come out and declare it: There is never a reason to pay full price for a flight. Never! If you’re the type to simply search a flight on your preferred airline’s website, choose the lowest price you see, and start packing, then this article is definitely for you. Here are 30 amazing travel hacks for finding the very best flight deals. Hack #1: Use the right search engines. Google Flights: The best, according to the experts. Allows you to compare all kinds of data to ensure the best prices. JetRadar: Their search includes various budget airlines, unlike many other popular search sites. Skyscanner: A great place to find deals. They also offer an app. AirFare Watchdog: A great site for tracking routes in which you’re interested. kiwi.com: Will mix and match airlines and airports to find the very best deal. Hack #2: Be flexible about when you leave. Flexibility is the #1 strategy for saving money on airfare. Use websites like Google Flights, the Matrix Airfare Search, or Skyscanner to figure out which departure day offers the least expensive flights. 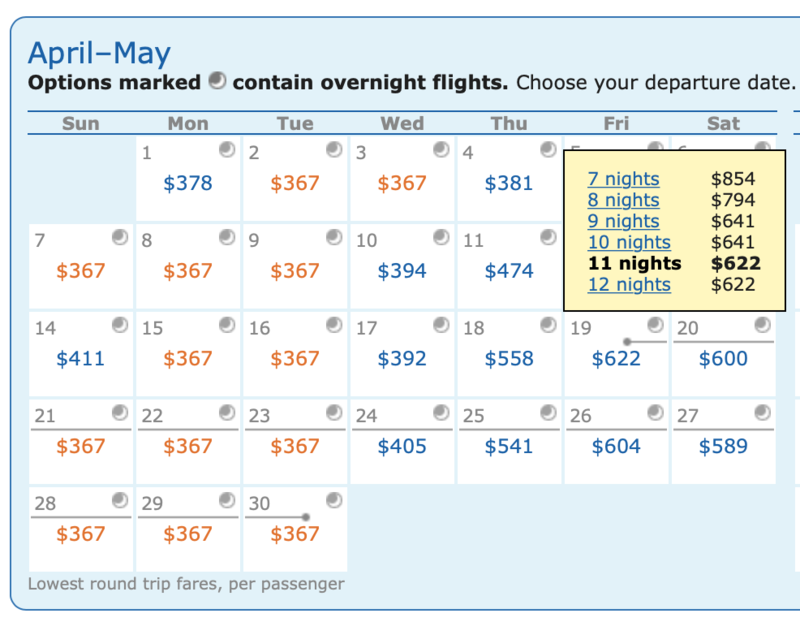 For example, the calendar below from the Matrix Airfare Search shows the cost of a roundtrip flight from San Francisco to Paris leaving on each day in April. 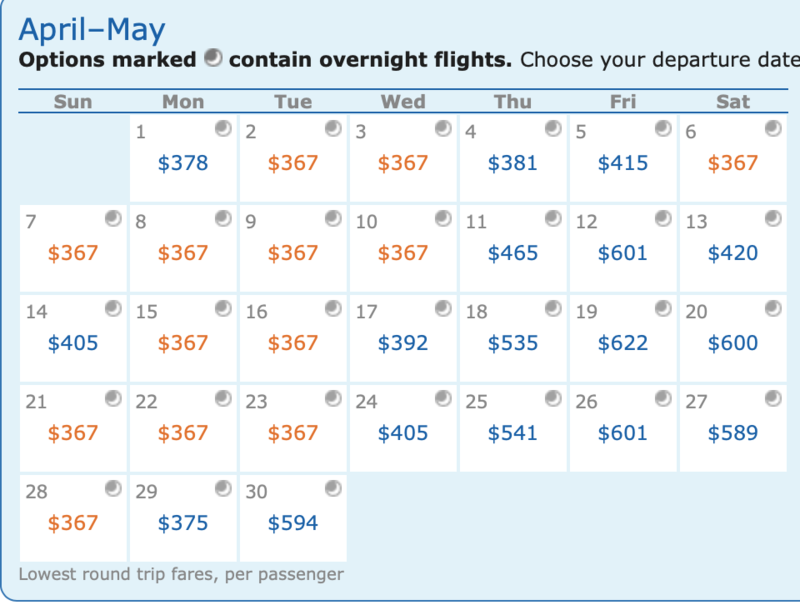 In multiple instances, the same flights cost a difference of up to $255 only a few days apart. Hack #3: If you can, be flexible about the length of your trip. Another way to be flexible is to be open about the length of your trip. The calendar shown above is for a trip of 14-20 days, with the cheapest available ticket highlighted on each calendar day. If you click on any of the days, you’ll see just how much the prices change depending on the duration of the trip. If we wanted to leave San Francisco for Paris on April 19th, our flight would be $213 more expensive if we stayed seven nights, as opposed to 10 nights. Our flight would be cheaper still if we stayed 11 or 12 nights before returning home. Hack #4: Be flexible about your destination. Websites such as Google Flights make it easy to find amazing flight deals based on even the vaguest travel plans. For example, if you know you want to go to “Europe” for “one week” sometime in the “next six months,” Google Flights will find you all of the best travel deals that fit your demands. This search feature is fantastic for the traveler willing to go and experience just about anywhere, but as our next travel hack shows, it can be also be helpful to the traveler hoping to fly into a specific city. Hack #5: Fly into a nearby city. Hack #6: Don’t be afraid of local airlines. Hack #7: Use the “Flight Insights” feature on Google Flights to find better deals. If you’re looking for flight options on Google Flights, take full advantage of the Flight Insights feature. This unique tool looks at your trip from various angles, and will readjust its search results if it finds cheaper departure dates or a better deal out of a nearby airport. Hack #8: Sign up for flight tracking. If you are dead-set on visiting a particular city or country, you must travel at a particular time, or you’re not willing to wait for an amazing flight deal to pop up, then signing up for a flight tracking service is highly recommended. Sites like Skyscanner, Hopper, and Airfare Watchdog will routinely notify you of new prices for your route. Should an excellent deal pop up, you’ll be notified and can book as soon as possible. Hack #9: Pounce on mistake fares. Airline prices may be automated and computerized, but that doesn’t mean mistakes are impossible. Indeed, dozens of mistake fares pop up daily, and for the lucky travelers who find them, booking quickly can mean incredible savings. For the best shot at finding and booking a mistake fare, sign up for notifications from sites like Secret Flying, Scott’s Cheap Flights, and The Flight Deal. Just beware, mistakes are often quickly fixed, so don’t linger! And while most airlines will honor any bookings made, it’s best not to pay for any hotels or tours until at least 24 hours have passed. Hack #10: Fly a budget airline. Asia and Europe have long been the leaders in budget airlines. Airlines like Air Asia, Jetstar, RyanAir, and EasyJet offer excellent service and extremely inexpensive ticket prices in exchange for simpler cabins and fewer extras (i.e. no free drinks, no free checked bags, no advance seat selection). Fortunately for those hoping to score the very best flight deal, North America is starting to catch up on the whole budget airline thing. Norwegian Air and WOW Air are two notable standouts. 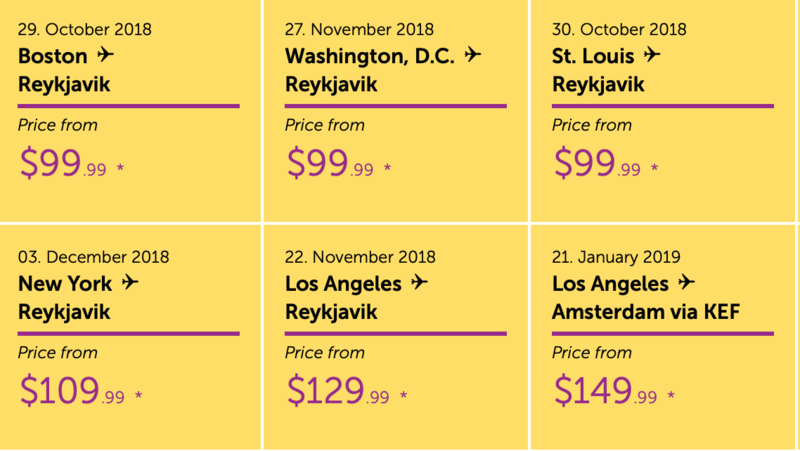 Both offer incredible deals to Europe, with the option of adding on the “fixings.” Below are some typical one-way prices offered by WOW Air. Hack #11: Being a light packer can mean extra savings. Budget airlines like those mentioned above are proving to be so popular that legacy carriers such as United, Delta, and American have begun to compete. These larger carriers now offer Basic Economy tickets — that is, affordable tickets that do not include a checked bag, do not allow you to choose your seat assignment, and do not provide free drinks or snacks. A Basic Economy flight deal can often be quite hard to pass up. It’s great for the traveler who can pack only a carry on and bring his or her own snacks on board. Hack #12: Schedule layovers to earn more vacation time. Booking through a website like AirWander also allows you to extend layovers. Hack #13: Book connecting flights yourself. another from Los Angeles to Sydney. This option yielded a lowest price of $1,158. In this case, a savings of $30 may not be worth it unless you like the idea of spending a day or two exploring Los Angeles. Still, this strategy can save hundreds on certain routes, or if you take the time to include searches on budget airlines. Hack #14: Start tracking international airfare about six months out. If you must leave or arrive at a certain place on a certain day, use sites like AirfareWatchdog to start tracking your flights about six months out. But don’t book quite yet! Chances are, you’ll notice flights starting to trend downward at about four to five months out. Since mistake fares or unadvertised sales are impossible to predict, this is the best time to purchase your ticket if you’re travels are not flexible. Hack #15: Sign up for a credit card that earns you travel points. For those who can commit to charging everything — and paying it all off at the end of the month, of course — traveling on credit card points can be very rewarding. To make the absolute most of your credit card charges, sign up for a card that earns you flexible points to use on a variety of airlines. 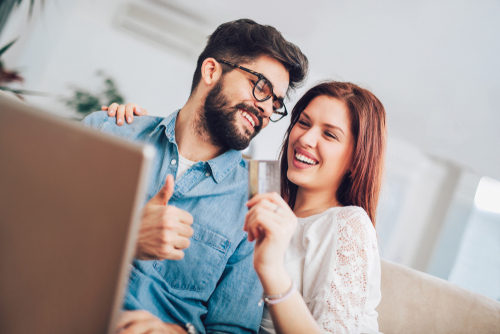 Brian Kelly, perhaps better known as The Points Guy, specifically recommends cards that associate with the American Express Members Rewards program or Chase Ultimate Rewards. Hack #16: Have a variety of mileage accounts. As mentioned above, very few airlines or credit cards make steadfast loyalty worth it in terms of saving money on flights. For this reason, Matt Kepnes of the popular travel website Nomadic Matt recommends opening mileage accounts with each of your favorite airlines.Then concentrate on those few accounts that will most benefit any upcoming travel plans — even if those travel plans are only theoretical at the moment. Hack #17: Plan to depart on a Tuesday or Wednesday. Studies have shown that fewer people travel midweek, which has made flight prices lower for departures on these days. Hack #18: Try at all costs to avoid departing on a Friday, Sunday, or Monday. Business travelers and those leaving for vacation after a work day almost always depart on a Friday, Sunday, or Monday. Because these are the most popular days for flying, they also tend to be the most expensive. Hack #19: March and June are the most expensive times to fly. Just like prices tend to go up on Fridays, Sundays, and Mondays, so too do prices rise in March for Spring Break and June when kids get out of school. If your timing is flexible, try to fly in February or April and later in the summer. Hack #20: Book holiday travel on time. Barring some error fare, the holidays are not the time to expect an amazing flight deal to pop up. Still, there are some things you can do to pay less for your flight. One of the best strategies is to book “on time.” According to Patrick Surry, the chief data scientist at the flight search website Hopper, the best time to book a flight for Thanksgiving is the week before Halloween. The best time to book a flight for Christmas or another December holiday is 83 days before departure. Hack #21: Consider flying into alternate airports. According to Hopper, travelers can save up to 10% on their flights by flying into alternate airports. For example, if you are searching for the best priced flight into London, consider looking at flights into Gatwick or Stansted, instead of the usually more expensive Heathrow. If you’re flying into San Francisco, you may find a better deal into nearby Oakland or San Jose. Hack #22: If you’re buying multiple tickets, buy them one at a time. According to Hopper, many popular airfare search websites reveal just one ticket at the lowest price available. When customers choose to purchase more than one ticket, their quoted price for each is actually rounded up to the next-highest available fare. Avoid this by booking your flights one at a time. Chances are you’ll be able to score all the seats you need at the lowest price available. Hack #23: If you search for the same flight multiple times, switch internet browsers or go incognito. While some websites and frequent travelers call this a myth, others swear that searching for the same route on multiple occasions will bring up higher and higher fares each time. The jury may be out on the truth, but in the meantime, we say switching browsers or going incognito until you’re ready to book won’t hurt. Hack #24: Remember it may be cheaper to book a flight in another currency. Some search engines such as the Matrix Airfare Search will allow you to switch the currency of the flights you’re searching. Alternatively, some savvy travelers will compare the best flight deal in their own currency with the flight prices offered by their destination’s currency. For example, if you’re looking to fly from New York to Oslo on Norwegian Airlines, you may try searching for your flight on Norwegian Airlines’ official Norwegian website (i.e. Don’t switch to their U.S. site) in Euros. While it won’t work every time, doing so can save you up to 30% on the price of your ticket. Just make sure you’re using an online conversion calculator to ensure you’re actually getting the price you think you are. Hack #25: Create an itinerary out of one-way tickets. It’s commonly assumed that the best prices are for round-trip tickets. While this is mostly true, about 18% of the time it’s not. Before you book, do a quick search for the same route in one-way tickets and see if you’re really getting the better deal. On the other hand, don’t be afraid to book a round-trip flight if you only need it one way. For example, if you’re flying one way from Berlin to London, it may be cheaper to purchase a roundtrip ticket, then ignore the journey back. One of our very best pieces of advice is to be spontaneous. No one can predict which destinations will have a great deal, or which airline will hold an unadvertised sale next. The best flight deals are purchased by those who are spontaneous enough to grab an amazing price — regardless of destination. There are some incredible places on this planet. Don’t miss out by waiting for the same few destinations. Hack #27: Take advantage of student discounts. If you’re under 26 years of age, you can book flights with a 20-30% discount. These can be found on sites like Flight Centre or STA Travel. Hack #28: It’s okay to fly multiple airlines in a single trip. A lot of people think that if they fly one airline to their destination, then they are limited to that same airline for their trip back. Not true! Mixing and matching airlines throughout your trip is a great way to save money. In fact, many flight search websites, including Expedia and Cheapoair, will automatically arrange the least expensive mix of airlines to fit your needs. Hack #29: Don’t believe the flight booking myths, and understand how the process works. Even if you’re not ready to purchase a flight in the near future, we recommend starting to track various flight and flight deal websites such as Skyscanner, Airfare Watchdog, Scott’s Cheap Flights, or Secret Flight in order to get a feel for the system. Not even the best trackers can predict the best flight prices. Still, you can save money by knowing how the process works. By the way, it is not cheaper to buy a flight on Tuesday. Don’t fall for that commonly pushed myth. Hack #30: Follow your favorite airlines on social media. While the best sales will almost certainly be picked up by flight trackers like The Flight Deal and Scott’s Cheap Flights, you can often get a head start on any deals by following your favorite airlines on social media. European budget airlines are especially great at advertising great fare deals on their various social media accounts.